A powerful tomato fertilizer may be just the ticket if you've been thinking about the best way to give your tomato plants a boost. Growing beautiful and tasty tomatoes is a passion for many gardeners around the world, but many factors go into raising the best fruit (tomatoes are fruit!) possible. While tomatoes are considered one of the "easier" plants to grow, you don't have to settle for mediocre returns – a variety of tomato fertilizers and aids are available to help you get the most out of your plants. Before running off to the store to buy a tomato fertilizer, it's important to understand a few concepts about fertilizer in order to get what you need without wasting your money. Click any link to read more. 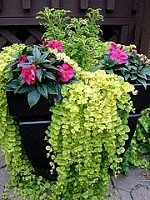 Links lead to our detailed product reviews on Container Gardening For You. Most tomato fertilizers are made up of Nitrogen (N), Phosphorus (P), and Potassium (K). 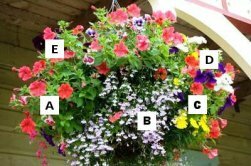 The amounts of these three nutrients will appear (in that order) on the fertilizer bag as three numbers, like 10-10-10, or 5-10-20. This tells you what you're getting and how much. Nitrogen is mainly for growth and greenery, which is great for the beginning stages of plant life. 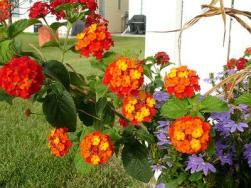 Phosphorus is used for helping your plant develop a solid root system and strong blooms. Potassium aids in water movement, giving you sweet and appealing fruit, and also helps in overall plant health. Keeping a close eye on your soil's pH is an overlooked yet important element of gardening. Most plants thrive better in a neutral (pH = 7.0) or a slightly acidic soil (pH < 7.0). Several products exist that can alter your soil's pH level, such as agricultural lime and coffee grounds. However, it takes many months to alter your soil's pH, so keep checking! If you have had great success with tomato fertilizer methods, then please click here to share! Other tomato fans will thank you. You know the old saying – "You are what you eat", well, it's true! Many commercially available tomato fertilizers are chemically treated to make the nutrient levels higher, which helps your plant absorb the nutrients easier. So how do you avoid all of these potential negatives of inorganic fertilizer? Make your own! Composting grass clippings, leaves, yard scraps, vegetable matter and food scraps are just a few of the ways to make an organic tomato fertilizer. To add even more power to your organic tomato fertilizer, consider adding bone meal or fish meal and a bit of garden lime (to help keep the soil pH stable). While organic tomato fertilizer is less potent than commercial fertilizers, it's healthier for your soil, plant, and your wallet. Check out this cool video about fertilizing. On the opposite end of the organic spectrum is ammonium sulfate tomato fertilizer, or if you prefer, 21-0-0, meaning this fertilizer is all nitrogen (and sulfur). This type of fertilizer is great for lowering the pH of an alkaline soil and stimulating leafy plant growth. Keep in mind that due to the lack of other nutrients in ammonium sulfate fertilizer, too much nitrogen can cause an unhealthy spike in soil acidity and overstimulate leafy growth on your tomatoes. While an abundance of leaves may sound like a good thing, it can actually add more stress and work to your tomato plant, taking away precious resources needed for bearing fruit. Before use, check your soil's pH to ensure you won't be lowering the pH too much. An interesting side note is that ammonium sulfate is a common food additive, found in breads and flour. Ammonium sulfate has also been banned in several countries due to it's potential as an explosive. Sure, it sounds a bit gross, but chicken manure fertilizer is quickly becoming a popular alternative to inorganic fertilizers. Chicken manure fertilizer is rich in all three important nutrients, especially nitrogen. Chicken manure works great when added directly to your garden or as an additive to your organic compost. Either way, rest assured that you're getting an awesome tomato fertilizer that's economical, environmentally friendly, and great for your tomatoes! You can now buy chicken manure fertilizer at most garden centers or home improvement stores, but the cheapest method might be through contacting a local farmer to see if they have any extra. Because "fresh" chicken manure is so abundant in nitrogen, if you plan on applying directly to your garden, do so about a month before you plant any tomatoes to ensure you don't get the dreaded "nitrogen burn". Phosphate, that great little nutrient used for building strong roots and blooms, can come from many sources, but the two best source of an organic phosphate fertilizer is from rock phosphate or bone meal. Seed meal is also a great organic source of phosphate. To get the most out of your phosphate fertilizer, ensure that your soil isn't too alkaline (pH > 7.0) as phosphate is more readily absorbed by tomato plants that are in neutral or slightly acidic soils. To make your own organic phosphate fertilizer, buy a few pounds of bone meal, mix in a few pounds of fish meal, and to increase absorption, add in some agricultural lime. This ultimate phosphate combination will help get your soil down to an optimal pH level and also you're your tomatoes that boost they've been craving. Don't get too crazy with the phosphate – research has shown that a phosphate overload can cause precious minerals in the soil, like zinc and iron, to be depleted. From the sea to your garden, liquid seaweed fertilizer can give any garden a healthy boost. Liquid seaweed fertilizer was once a closely-guarded secret among horticulturists, but over the years, word has spread, and you can now find liquid seaweed fertilizer at almost any garden center. Liquid seaweed fertilizer is a mild fertilizer with very low N-P-K levels (usually 0-0-1), but it contains trace elements that are essential for plant growth. Liquid seaweed fertilizer is a great all-season fertilizer, but can give your tomato plants a powerful boost during the delicate beginning stages as it contains natural growth hormones. Some brands of liquid seaweed fertilizer also include a fish emulsion, which boosts the N-P-K rating. Most liquid seaweed fertilizer are mixed with water before applying to your garden, so one bottle will go a long way! 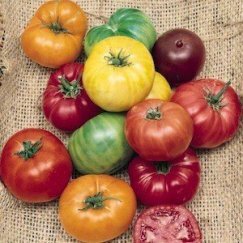 Every unique fertilizer has its role in growing great tomatoes, but above all, a healthy blend of nitrogen, phosphate, and potassium is essential for getting the most out of your plants. One nutrient isn't going to revolutionize your garden – it takes a potent combination of several sources to ensure your tomatoes are getting all the love they need. By utilizing the tomato fertilizers outlined in this article, you can sleep a little easier knowing your tomatoes are out there growing happily. Tomato Fertilizer Recommendations: Top Products to Help Your Tomatoes! Tomatoes are undoubtedly considered a staple in a vegetable farmer's garden. Enjoying freshly picked tomatoes straight from your backyard is one of the simple joys of home gardening one should experience. Though tomatoes are easy to grow and look after, half of them would long be dried up weeks before expected harvest time, unless you step in to help them. Yield more tomato blooms when you try spraying them with the Bonide Tomato Blossom Set Spray. Tomatoes are good examples of plants that are both easy and difficult to grow. One does not have to be a master gardener to plant and grow this kind of harvest. At the same time, tomatoes often play victim to illnesses. These problems are mainly due to weather conditions, which is something one cannot control. Despite this problem, you can still protect your tomatoes with the Bonide Tomato Bloom Set spray. It contains Kinetin, which results to higher yields of plants. It was the first cytokinin hormone recognized for its growth-promoting effects on plants, without any effect to the plant quality. 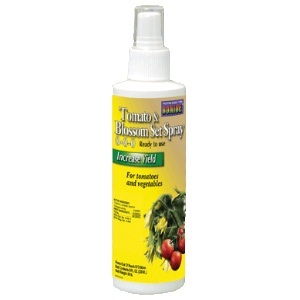 The bloom spray is also suitable for eggplants, cucumbers, other vine plants, even strawberries. All it takes is to aim and spray the product on the flowers and leaves and expect an increased harvest of your produce. The Bonide Blossom Set will do wonders for your tomatoes and other vegetable plants. When applied with a more accurate sprayer, you will be very happy to see the increase in harvest and quality of your vine crops. When growing organic crops, you should be very cautious as to what fertilizer you mix in with the soil. A healthy soil should contain a good number of minerals as it is the primary source of nutrition for the plants. Feed your soil with enough nourishment by mixing in Azomite Organic Trace Mineral Soil Fertilizer. Azomite stands for A to Z Of Minerals, Including Trace Elements. When ground to dust, Azomite can pass trough cell walls of an organism to aid in its optimal performance. It has been first introduced and utilized by geological prospector Rollin Anderson. Boasting with 67 trace minerals, including Selenium, Vanadium, Chromium, this soil additive would show super fast results. Expect your plants to grow taller the next day after sprinkling them with a bit of Azomite. You can use Azomite on almost anything, from a potting soil mixture to animal livestock feed mineral supplement; there are even those who take it internally. Azomite is all natural and organic. Azomite as a fertilizer would provide some of the necessary minerals to the required mineral balance for growth and overall production. It can supply essential minerals and nutrients that would improve total soil quality. Azomite is an amazing product that would be perfect for your tomato gardening. When applied on the soil or on the plants, results are incredibly fast and almost immediate. It is also very affordable, and can be used for other purposes as well. To properly grow delicious tomatoes, one must do more than just planting and watering. Tomatoes are prone to illnesses thus, needing more nutrients than common vegetable crops. When you find that your current tomato fertilizer is not enough, you might want to consider using Jobe's Tomato Outdoor Fertilizer Food Spikes for a reliable. low-maintenance way of keeping your tomatoes well fed. Oftentimes, surface fertilizers are washed away by the rain or simply when watering the plants. If this continues on, you may have used a bag of fertilizer, yet the nutrients your tomato plants receive is still equivalent to that of a cup. This is why Food spikes are so much better that using regular fertilizers because for one, they last longer. Two, they nourish the plants, not the soil surrounding it. Expect your tomatoes to grow healthier and brighter with a pack of Jobe's Outdoor fertilizers. It directly provides the nutrition to the roots where your plants can immediately receive and consume it. These tomato fertilizer spikes are specially formulated and pre-measured for a fast and hassle-free tomato fertilizing experience. Spikes are contained and available in a waterproof resalable zip-pouch or a cardboard blister card-Pack. This bag of fertilizer is what your tomatoes need. Although pricey, Jobe's Tomato Outdoor Fertilizer Food Spikes do a better job than traditional tomato fertilizers. For the quality and savings it offers, it will be cheaper in the long run. In the battle of chemical fertilizer vs organic fertilizer, there is only one winner. More and more gardeners recognize the foolishness of applying chemicals to food they are growing for themselves. It's bad for the planet, and bad for your body. So trust Jobe's to create one of the highest-rated organic tomato fertilizers available. BioZome, as Jobe's call it, makes a remarkable difference when compared to other leading organic fertilizers and it is only available in Jobe's Organic fertilizers. Jobe's organic tomato fertilizers focus more on the roots and soil as opposed to liquid fertilizers. It allows nutrients to flow out over time rather than flooding the plants with nutrients in one single application. Fast results: This organic fertilizer contains BioZome that would help your tomato plant grow greener leaves and yield bigger and brighter tomato blooms. 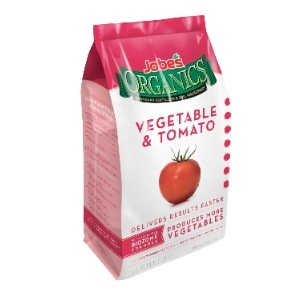 Jobe's Organic Vegetable & Tomato Fertilizer is the front-runner in today's organic fertilizer products. With the addition of commercially developed Archaea, the mix has completed the basic components of creating the perfect gardening soil. This product is highly recommended for professional and leisure farmers. If you're looking for a one-stop resource for all your tomato plant care requirements, then check out our value-packed eBook below! 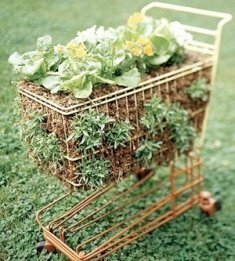 Find more Container Gardening Ideas and Advice!